RODRIGO DÍAZ de VIVAR, “el Cid"
Ever since childhood I have regarded Rodrigo Díaz de Vivar as a much admired hero. One of those figures from history that are, somehow, larger than life. In a period when Europe was dominated by robber barons and warlords, he stands as a man of exception, a man of courage and even honour. 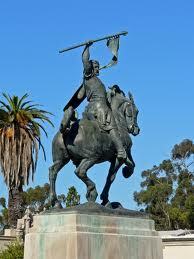 The film, el Cid, of 1961 may have portrayed him as a paragon, which, of course, he was not, but it did show the personality that was to endear him to generations of Spaniards. His marriage to the beautiful Jimena produced three children; a son who died in battle without issue, and two daughters who married into Spanish nobility. Through his daughters he was to become an ancestor of most of the royal houses of Europe. I have therefore decided to trace his line and, where it crosses that of William the Conqueror, link it to the main part of this website. To those who follow William's descendents, I will continue but run the lines in parallel. The format will be slightly different to that of William the Conqueror. Instead of carrying a line right the way up to modern day, I will complete each section as I go. There will be no ISSUE SEE's on the early sections with no destinations. I will also include the section titles instead of just HERE. You will get used to it as it expands. All the names will also be included in the search engine on the Genealogy Page. Let's get to it. The sections are listed below! !